Enthroned on Our Praise, volume four in the NEW AMERICAN COMMENTARY STUDIES IN BIBLE AND THEOLOGY series, examines God’s revelation of Himself in the Old Testament, prompting readers to deeply consider what He truly desires from faithful followers in times of worship. An excellent resource particularly for pastors, worship leaders, and worship classes, Enthroned on Our Praise looks at what the Scriptures identify as elements of worship and fosters a fresh appreciation of the Old Testament and its contributions to a close relationship with God. Users will find this an excellent extension of the long-respected NEW AMERICAN COMMENTARY series. 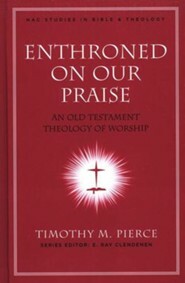 Timothy M. Pierce is assistant professor of Old Testament at Southwestern Baptist Theological Seminary in Fort Worth, Texas. He holds a Ph.D. and M.A. from that same seminary and a B.A. from Wayland Baptist University. Pierce is married and has three children. Enthroned on Our Praise, volume four in the "New American Commentary Studies in Bible and Theology" series, examines Gods revelation of Himself in the Old Testament, prompting readers to deeply consider what He truly desires from faithful followers in times of worship. Users will find this an excellent extension of the long-respected "New American Commentary" series. I'm the author/artist and I want to review Enthroned on Our Praise - eBook.